"When I was drinking hot chocolate today, I thought, 'Man, I wish dad was here. He always gets the lumps out of it.'" How can we know that the Bible is the Word of God? What Jesus was saying is that when God’s Holy Spirit is on the loose in people, we can neither control the Spirit nor, usually, see what the Spirit has been up to until after He’s completed His work. Like the wind, we can’t see the Holy Spirit, we can only see the evidence of His activity in people’s lives. This, I think, is a good place to start when examining our question for tonight, how can we know that the Bible is the Word of God? How did He understand Himself? Is the Bible reliable, is faith logical? and others. They all demonstrate that the historical evidence and logical cohesion for believing in the truthfulness and reliability of the Bible are overwhelming. That man’s belief was no different from that of the devil’s. The devil absolutely believes that God exists. He knows what God has done. And, as his encounter with Jesus in the wilderness shows, he knows the Bible inside out. But the devil lacks faith. And so did that man. Faith is what happens when we pull down our shields--shields like self-sufficiency, egotism, fear of losing control over one’s life--to open ourselves to what God wants to give us and do in us, now and in eternity. Faith is about surrender to the God we meet in Jesus. 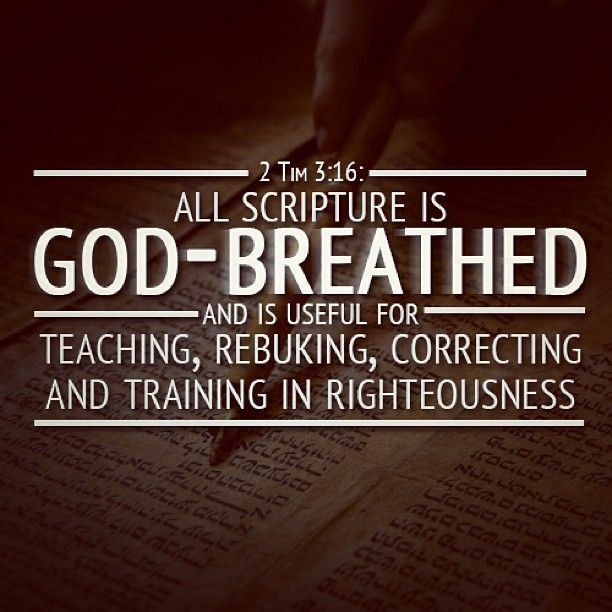 Second Timothy 3:16 says: “All Scripture is God-breathed…” Now, both the Old and New Testament words for breath--ruach in the Hebrew of the Old Testament and pneuma in the Greek of the New Testament--can also carry the meanings of wind or spirit. What Paul was telling young Timothy is that while the Scriptures may look like nothing more than words on a page, they’re actually as infused with the life of God as Adam was when God breathed into dust and made the first human being; they’re as filled with the life or Spirit of God as the first Christian disciples were when, on Pentecost, the Holy Spirit came to them on the rush of a mighty wind. Fine, you may say, the Bible is Spirit-inspired. How do I know that's all true? We live in a condo. This past week, workers came to the development to clear away the branches that had blown down from the trees and, in at least one case, clear away an entire tree that had fallen, all because of the high winds we’d had a few days before that. Many of you will remember that particularly windy day. But you remember it not because you saw the wind in the same way that you could have seen rain or snow or a bright sun; what you saw was the evidence of the wind from what it was doing. And this, I think, can point us to how we can know that the Bible is the Word of God: We can see the changed and changing lives of those who are being exposed to the Bible! 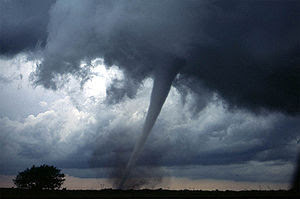 The changes wrought in believers by God’s Word in Scripture may happen slowly in some, or come with hurricane force through many aspects of life in others, or in fits and spurts in still others. But when we let the Bible immerse us in the truth God--as we read it on our own, as we receive it in, with, and under the bread and wine, as we hear it proclaimed or taught, as we place ourselves under it as God’s authoritative and life-giving Word for our lives--we see the evidence for the Bible being the Word of God. The Bible is the Word of God first and foremost, because it changes us. sets us free to live as people confident of their Father’s love and certain of their Lord’s presence with them in the good and in the bad, all the way to eternity. The Holy Spirit’s imprint is on every letter of Scripture to present the Word about Jesus so that people immersed in its truth have and are strengthened in their faith relationship with Jesus. The Word of God then, is Jesus. This is the Word let loose by God over chaos in Genesis 1 to say, “Let there be light” and there was light, “Let there be land” and there was land. “Let there be stars and sun, moons and planets, and human beings made in My image” and all those things and more came into being. We can speak of the Bible as the Word of God because, from Genesis to Revelation, it points us to Jesus the Word of God. The Word about Jesus that God so loved the world He gave His only Son that whoever believes in Him will not be condemned for their sin, but live with God eternally, can be imparted in many ways: over coffee with a friend, in a locker room at school, during lunch with a co-worker, from a pulpit, in small groups studying God’s Word together. And we will know when we’ve heard the Word of God when it conforms to all that God reveals about Himself in the Bible’s sixty-six books and when it challenges us or comforts us or stretches us to be remade by God to look more like Jesus Himself. We know the Word of God is in the Bible when we see the impact it has on us or others, how it challenges us to turn from sin, how it incites us to trust in Jesus Christ, how it empowers us to pray, to witness, to serve, all because this Word from and about Jesus sets us free to live for the Savior Who lived and died for us. The Word of God we find in the Bible is a mighty wind blowing away the old and dead and breathing life into the new and eternal. 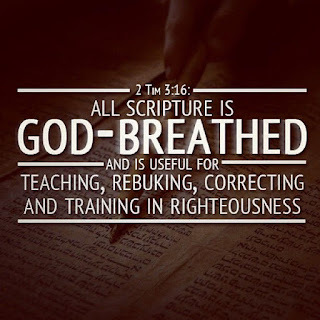 The Bible is the Word of God. When we let it have its way with us, we won’t need evidence to prove that. The evidence will be found in what that Word does in us, to us, and for us. "There is a lot of fear in the world, we shouldn't make our imagined fears bigger than someone else's real fears." That's what my son, Pastor Philip Daniels, observed while presenting this video from George Takei over on Facebook. I couldn't possibly agree with Philip more. I am especially stunned by the amount of fear that exists in America today. It makes me think of Jesus' words about it being easier for a camel to go through the eye of the needle than it is for a rich man to enter the kingdom of heaven. That's because most Americans--at least white Americans who make up the lower middle class, like me--are wealthier, safer, and more secure than any other people in the world, more than any other people in the history of the world. I can only read the fear that pervades America today as an indication of our poor spiritual health, of how far we have wandered away from the God we meet in Jesus Christ. Because we so value the finite things of this world, our culture and our politics are pervaded by shallow hedonism, indifference to others' humanity, and constant fear. And this fear exists despite how much safer America is than at any time in the past twenty-five years. When money, pleasure, and personal happiness are your gods, fear takes control. We are so afraid of losing what we have, that we are in danger of losing the life that only the God we know in Jesus Christ can give to us. Christ calls us to a life of love for God and neighbor, set free from sin, the inborn condition that leads to things like fear, hedonism, authoritarianism, racism, and terror. I want the boy in this video who longs to become an inventor and a pastor to be able to see his dreams come true. That can only happen when the leaders and the people of the world let go of fear and act with hope and faith. This doesn't mean that we dismantle our armies or our missile silos; there are still bad people unwilling to live in relationship with God and neighbor, from whom children and all people need to be protected. It is to provide for such protection, security, and the general welfare that God has established governments on the earth. But, if we will turn to the Lord Jesus Christ, the prince of peace, our lives will be transformed and we can live in the midst of the dangers and difficulties of this life without fear and instead, with hope, with faith, with peace. I recognize that we live in a pluralistic nation. I don't believe in an established religion for the United States. I believe that Christianity, in fact, thrives in pluralistic societies because when people can freely consider Christianity in comparison with other ways of approaching life, Christianity will win people's hearts and lives. But, having experienced life with Jesus Christ for forty years now, I can tell you confidently that He imparts the peace of God to those who trust in him (even as I confess to trusting Him imperfectly) and is, as He Himself has said, "the way, and the truth, and the life." Please consider following Jesus and be empowered to deep-six fear! Our first lesson for this morning, Genesis 12:1-9, recounts the pivotal moment when a man named Abram--who would later be known as Abraham--left all that was familiar to him in obedience to God’s call and in response to God’s promise. On first blush, the central character of the lesson seems to be Abram, the one who picks up stakes and moves to who-knows-where with his wife, his nephew Lot, his possessions, and his servants. But, in truth, the central character is God. Abram was just a member of the supporting cast. As his life unfolded, Abram did well and played a critical role in the revelation of God’s purposes in the world--in other words, he was blessed--when he remembered Who was the star and who wasn’t. Abram made a mess of things--in other words, he was cursed--when he thought that he was the star of his own story. We would do well to remember this, to trust in God to take the lead and to be good for all of His promises in our lives too. That’s a big part of what the lesson can teach us today. The first thing to say about this passage and then move on quickly is that, we may think, “Lucky! God gave Abram clear directions.” But not always; one scholar estimates that God spoke to him about once for every twenty-five years of his life. The truth is that in discerning God’s direction and will for our lives, we have an advantage over Abram. We have the Bible, God’s Word; Abram didn’t. If we want God speak to us as God spoke to Abram, all we need to do is read His Word. We also have the Holy Spirit; Abram didn’t. Through a few minutes of daily Bible-reading, followed by prayer in Jesus’ name that’s powered by the Holy Spirit, you and I can hear more from God than Abram ever did in his whole life time. More importantly, consider who takes the initiative in this verse. God calls Abram to leave behind everything he knows in order to go someplace that God will show Abram. Imagine how crazy Abram’s decision to leave must have seemed to his family and countrymen. They were all idol-worshipers, their lives spent placating all sorts of gods. The whole notion of there being just one God Who created and cared about His creation would have been foreign to them all. So would the idea of leaving family, friends, and the familiar for parts unknown. But here’s the deal. If God really is the God of all creation, He has every right to be obeyed when He calls us to do things that may not be easy. Things like putting God first in our lives, or loving even those who hate us, or taking the risk of telling others the good news of new life for who turn from sin and trust in Jesus as their Savior and God. Isaiah 45:9 asks: “Does the clay say to the potter, 'What are you making? '” The creatures--human beings--get in trouble when we start to ignore the Creator Who made us. We knew some folks who, when their kids were in their teens, moved into an area with a number of Lutheran churches. They finally settled on filled with older people and no youth program. "Why did you do that?" their friends asked. "Why be part of a church that has nothing to offer you?" Our friends explained that, first of all, it wasn't true that the church they decided to join had nothing to offer. But, more than that, they explained, "We were looking for a church where we could serve." That couple understood that God doesn't always call us (or sometimes, command us) to the easy path, only the best path. Of course, God gives all sorts of commands to the human race, commands that we ignore. Just think of the Ten Commandments. Millions of people push to have the Ten Commandments erected in stone on court house grounds, but only a small number of those millions can actually name more the four of five of them. We're not good at keeping God's commands either. Abram himself would later show a penchant for ignoring God’s commands. That penchant for sin has been baked into the human DNA since Adam and Eve fell into sin. God could bark His commands--His Law--at us from now until Jesus returns and those commands wouldn’t cause us to do what God tells us to do. The most that God's Law can show us is where we fall short as human beings and just how desperately we need God's help and forgiveness. God’s Law can’t change or move us. But God’s promises can. And, as we’ll see, when he left his home behind, Abram wasn’t just obeying a command given to him by God; he was also responding to a promise. It was that unlikely promise that compelled Abram to call in the moving vans! Abram, as we’ll see, was seventy-five years old when God spoke these words to him. His wife Sarai, later renamed Sarah, was ten years younger. Abram’s name, which means exalted father, hung over him like a sick joke because Abram and Sarai were childless. In that culture, in those times, you were thought to be cursed if you didn’t have children. But this God Who has chosen to introduce Himself to the idol-worshiping Abram says that the childless exalted father is going to become the father of “a great nation.” God promises that Abram is going to be the conduit through whom God will bring His blessings to the whole world. You and I know that it will be among Abram’s descendants that God’s Son will be enfleshed and raised, will die and rise. Abram didn’t know that then, though. He just believed and acted on that belief. Listen: Jesus calls you and I to be Abrams, too. We’re to act as God’s OB/GYNs, overseeing the rebirth of friends, family, classmates, and co-workers as we share Christ with them. What if Abram had turned a deaf ear to God’s call? Chances are, God would have found someone else to act as the father of nations. But Abram did believe! And he did obey! And because believed and obeyed, you and I are here this morning! Are you and I going where God tells us to go? Are we doing what God tells us to do? You and I have the promise of God-enfleshed Jesus, “I am with you always…” And we also have the same command as Abram, to “go and make [children of God, that is] disciples of all nations” [Matthew 28:19-20]. This command isn’t just for spiritual superstars. There was never anything spectacular about Abram, nothing in his idolatrous background to commend him to God. But, whenever Abram was able to get out of God’s way and get over himself, God’s word of promise created the gift of faith within him. And through that obedient faith, God was able to set off His salvation plan for the human race. God wants to make us agents of His salvation plan. God wants to bring His Word of command and promise to the whole world--and to our little corners of it--in and through you and me. God may not call us to pull up stakes and go somewhere He’ll show us on the way. But how can we share God’s Word about Christ in our familiar haunts, places like Dayton, Centerville, Springboro, Miamisburg, West Carrollton, Kettering, ot Lebanon? In verses 5 and following, we find Abram in the land of Canaan. God is giving Abram a sneak-peak of the land his descendants will one day inherit. “This isn’t your people’s land yet,” God was saying, “but one day, it will be.” Each time God reiterated His promise to Abram, Abram erected an altar to give God thanks and then moved on. For whatever sin God calls us to repent, we need to repent today because whatever in this world tempts us to sin is going to die. For whatever good God would have us to do, we need to do it today, because the clock is running out on this world and because the good we do in Jesus' name will have eternal significance. Above all, you and I must avoid getting too comfortable with this world or its ways. Like Abram, who became Abraham, we must be prepared to move on to whatever God calls us to next. The beauty and the comforts of this world are but a glimmer of the eternal beauty that God has in mind for us when Jesus returns and ushers those who have believed in Him into “a new heaven and a new earth” [Revelation 21:1], the place He has prepared for all who believe in Him [John 14:2-3]. That’s the true homeland that Jesus secured for all who believe in Him and in the power of His death and resurrection. This past week, John Ylvisaker, the Lutheran composer best known for I Was There to Hear Your Borning Cry, passed away. It no doubt came as an enormous surprise to Abram when God introduced Himself to him, and an even bigger surprise when God told Abram that he would become the father of all who believe in Him. But, as Ylvisaker’s song reminds us, the greatest surprise of all belongs to those who trust in the God Who revealed Himself to Abram and then ultimately, to all the world through Jesus Christ. The great surprise is this: Despite our lack of qualifications, despite what we deserve, we are saved by grace through our faith in Jesus Christ alone. To those who believe in Christ, God gives an eternal homeland. And no matter how long we roam on this earth, God will keep calling us to that homeland. Let the God you know in Jesus Christ be the central character in your life. Be a cast member in His kingdom. It will be the role of an eternal lifetime! Let Him sustain you with the promise and the certainty of citizenship in His eternal homeland that you received at your baptism.